A healthy dog should have high energy levels and a coat that shines, alert eyes and a body that is neither too lean nor too heavy. If the family pet is not feeling up to par, then taking a good look at the label of the food your dog has been eating, may just be the answer. Protein is of prime importance in the canine diet so ideally the first ingredient you see on any food should be something that is meat. It’s safe to settle for meat as a second ingredient but any lower than that on the ingredient list means gambling with your dog’s health. In general, dog foods should be about 25 percent protein and 15 percent fat. Also, when looking at a label remember that vague is bad, specifics are good. For example if the label says ‘poultry fat’ rather than specifying chicken fat, look elsewhere. Mysteries in pet food are something to be avoided. The more processed the food, the more it loses in nutritional value so try to find foods with whole, unprocessed grains and vegetables in them. Steer away from additives, chemical preservatives, artificial colours and flavours. Wet or canned foods are usually higher quality, have more protein and generally have fewer additives and preservatives than dry food. They are also more much more expensive than feeding a dog dry food, are less convenient and are cause more plaque and tartar buildup. Dry foods need to be of a high quality to compete with wet foods for nutritional value, though. Semi-moist foods are only recommended for an occasional feeding or as a special treat. While dogs find them exceptionally tasty, this is due to the high amount of sugar and salt that is added for taste. Semi-moist foods are generally considered the ‘junk food’ of the dog diet and the sugary stickiness also promotes tooth decay in canines. A dog’s diet should be about 50 percent carbohydrate based and gives them much of the energy they need throughout the day. 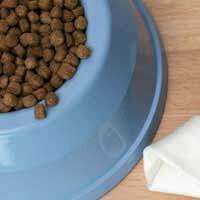 Corn, soybean, rice, wheat and potatoes are some of the carbohydrates common in dog food. The breed of your dog has an impact on what carbohydrates will be processed best and what will not work as well. For example, a breed originally from China will function differently on rice than a breed from England. It’s best to do a little breed specific research on nutritional requirements if your dog seems bloated, gassy or uninterested in food. Larger dogs generally get by on two feedings a day, once in the morning and once in the afternoon or early evening. Smaller dogs, the toy breeds in particular, need lighter, more frequent feedings. Weighing your dog and then following the guidelines on your dog’s food bag are a good start to figuring out how much to feed, but keep in mind these are just rough estimates of what your dog needs and don’t take into consideration levels of activity or breed requirements. Until you have the process fine tuned, weigh your dog frequently and keep an eye on your dog’s overall body fat. It’s best to use the same measuring cup every time you feed to keep things accurate. Table scraps and treats should only make up about 10 percent of a dog’s diet and should never be something sugary, salty, dairy based or greasy. Veggies, fruits and bits of meats are good snacks but should be put in your dog’s bowl and not given at the table as this encourages begging and other bad habits that can lead to dominance issues. And remember, a well-fed dog may cost a little more in the short run but will save your family expensive vet bills and heartache in the long run. So invest wisely in good nutritional practices for your pet.